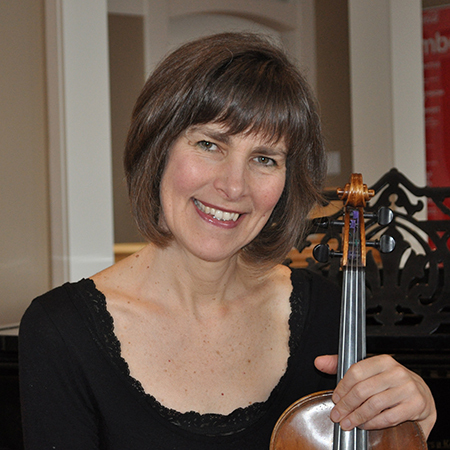 Though she has performed as a freelance musician throughout her career with such groups as the Vancouver Opera Orchestra and in various chamber ensembles, her passionate focus has been string teaching and developing the String Orchestras she has founded and nurtured over the last twenty seven years. Her ensemble, the Semiahmoo Strings, based in White Rock, are a group of advanced violin and cello students who perform up to three full programs each year. Such performances have featured Alexander Dobson (the great Canadian baritone), the Miles Black jazz trio, tenor Lance Ryan and many other guest soloists. The group recently performed Beethoven’s Fifth symphony with a professional wind and brass section. Her beginning string ensemble, the Demi-semiahmoo Strings, attracts beginning string players eager to become a part of her programs. Carla also conducts the Surrey Intermediate Strings Orchestra.